Heads up to those living in Palm Coast and Lakeland Florida, Dancing With The Stars Witney Carson and Chris Soules are reuniting to dance again in “Ballroom With A Twist”. Chris talks all about it with The Daytona News Journal. Here is a take from the link. For tickets, go here or here. Carson didn’t repeat as victor in season 20 — “her hopes of becoming champion were pretty dim once she had me as a partner,” Soules said — but she’ll be paired with him once again on the Ballroom with a Twist tour, which stops in Palm Coast Wednesday evening. The tour showcases a robust roster of TV stars from shows such as “American Idol,” in addition to the aforementioned dance-centric series. Though Soules stumbled upon fame inadvertently, Carson and many of the other Ballroom with a Twist cast members have pursued careers in entertainment and the arts since childhood. Carson said she auditioned for “So You Think You Can Dance” right out of high school when the show came to her home state of Utah. “My mom actually pushed me to do it last minute,” Carson wrote in an email interview. She not only made it onto the show, but reached the top six. In Ballroom with a Twist, Carson will be paired with Soules for a jive, “the first dance we did on Week 1, then we’ll do contemporary, which is the dance we received the highest score on later in the season. So they’re two of my favorite dances to perform,” said Soules. Be sure to visit the official Ballroom With A Twist Facebook page. They’ve posted some beautiful photos of the show and cast from their Christmas shows in Florida. Photo below of Gleb Savchenko, Elena Samodanova, and their little girl Olivia courtesy of Gleb’s twitter account. Beautiful! The dancing, directed and choreographed by Jaymz Tuaileva, is nothing short of spectacular. The real show-stopper is “American Idol” finalist Vonzell Solomon. That girl, aka Baby V, has some fine pipes. “Twist-Mas” features a live onstage band, with players who double as singers. My favorite is Chantil Dukart, who spent most of her time wearing headphones, hunched over her keyboards. But when she took off the headphones and hit center stage, that girl was on. While “Twist-Mas” features favorite Christmas themed-songs both sacred (“Silent Night”) and secular (“Jingle Bells Rock”), the main attraction is the dancing, executed by first-class professionals. You even get a question-and-answer session with the headliners. It’s been a longtime since I took ballroom dancing lessons from the late Miss Betty D’Avray. While the illusion is to look effortless, ballroom dance is deceptively difficult and a lot of work. If you can appreciate that, you will love this show. I know I did. To read the full review, see The Skip Sheffield. For tickets at more shows in December, see The Wick and The Hartfield Community College. What a fun blast from the past this is. If you go to WPBF.com, you can see former Dancing With The Stars pros Jonathan Roberts And Lacey Schwimmer talk about Ballroom With A Twist-mas. Note how Jonathan has choreographed some of the dances. You can see some of the costumes too. To read more on the show, see The Palmbeach Post. For tickets and all the dates in Decemeber, see The Wick. What a super interview with Gleb Savchenko and Hot Spots Magazine. He talks on his dancing career, Dancing With The Stars, Strictly Come Dancing, and performing in Ballroom With A Twist-mas In Florida on December 23 – 27th in Florida. When did you first know that dancing was going to be your career? When I won my first Russian Championship at the age of 12. I realized that’s what I wanted to do for the rest of my life. Tell us a little bit about Ballroom with a Twist-Mas! How does one combine ballroom dancing and the holidays? 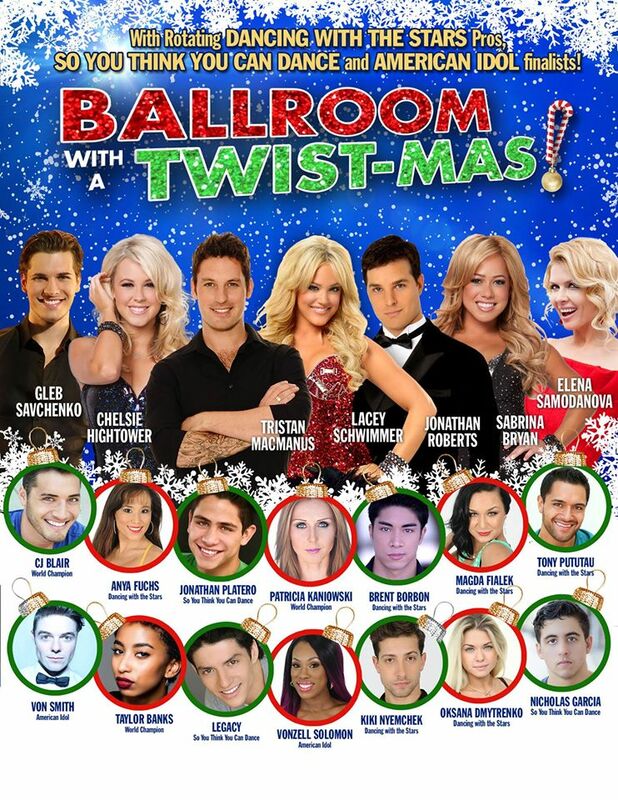 I’m very happy to be a part of the Ballroom with a Twist-Mas! show. It’s currently one of the best American dance theatre shows. People love dancing, especially during the holiday season, and they have a chance to see a dance performance in an intimate theatre with all the world’s best dancers in it. You’ve competed in a number of Dancing with the Stars franchises, and right now you’re in the BBC’s Strictly Come Dancing. How are you doing? Who is your partner and how well are you getting along? I’ve been doing DWTS in four different countries. At the moment I’m doing Strictly and I’m paired with a TV presenter, Anita Rani. We are doing very well and at the moment, we’re going through week 10 of the competition. Hope with all the hard work we put in, we will be able to get into the final and maybe win the Mirrorball. Be sure to read more at Hot Spots Magazine. To read more on Ballroom With A Twist-mas which includes other dates starting on December 10th and also includes performances from Gleb’s wife Elena Samodanova, Tristan MacManus, Chelsie Hightower, and Jonathan Roberts, see The Palmbeach Post. For tickets, see The Wick. Also, for those living abroad, Gleb’s wife Elena Samodanova is the choreographer for the new Dancing Stars Russia Tour which starts in February. You can read more on it at Dancing Stars Russia. This instagram has some fun teasers too. Beautiful photo of Gleb and Elena above courtesy of Elena’s Instagram. For those living in Florida or wanting to visit, gear up for a Ballroom With A Twist Christmas show which includes performances from Tristan MacManus, Gleb Savchenko, Elena Samodanova, Chelsie Hightower, and Jonathan Roberts. To read on the show, see The Palmbeach Post. For tickets, see The Wick. Oh, if I only lived closer!! ETA: Ballroom With A Twist-Mas is also coming to Harford County on December 21 at 7 PM in the APGFCU Arena at Harford Community College. Tristan MacManus and Chelsie Hightower will be performing. For ticket information, see this link. Thanks to Claire aka @@clrhmly for the heads up. If you live in the Harris, Michigan area and you want to watch a fun dance show this weekend, check out “Ballroom With A Twist” Friday (tonight) and Saturday to see Damian Whitewood, Dmitry Chaplin, Chelsie Hightower, Oksana Dymetrenko ,The Bachelor Chris Soules and more!! Below is a fun video teaser if you click on the link. For TICKETS, see Island Resort and Casino. Who is coming out to Island Resort Casino in Harris ,MI this Friday and Saturday Sept 18th & 19th to see Damian Whitewood, Dmitry Chaplin, Chelsie Hightower Oksana Dymetrenko ,The Bachelor Chris Soules and this amazing cast tear this stage up! ETA: Here is a segment about it at TV6. They interview the dancers…and check out Damian! I’d love to see him again…. Below is a new interview with Anna Trebunskaya taken backstage at Ballroom With A Twist! Thanks to Jim for the find and Ballroom With A Twist Facebook for posting. Don’t forget to catch the show in Patchogue, NY today with Gilles Marini added to the cast. For tickets, see this link. In more Ballroom With A Twist news, the cast attended the hit off Broadway show “Ruthless! The Musical” while in New York City this week. To view a fun gallery of backstage shots including photos of former Dancing With The Stars pros Chelsie Hightower and Dmitry Chaplin, see BroadwayWorld.com. Ballroom With A Twist producer Scott Stander advises everyone to see this show if you are in New York City. It’s “so much fun”! The cast of Off-Broadway’s smash hit Ruthless! The Musical met the stars of the live dance sensation BALLROOM WITH A TWIST, which is currently touring the country. And the sparks flew! It was a love-fest for the talented showmen and women after the August 10th performance of RUTHLESS! when the stars of both of both shows mingled and posed for photos.